We have a brand new trailer for Angry Birds 2. Video game movies are a difficult egg to crack. They're rarely good and virtually never great. With The Angry Birds Movie, while many adult moviegoers probably didn't walk out loving it, Sony was able to make a decent, or at the very least harmless, video game adaptation that wound up being rather successful. As such, we're getting a sequel later this summer and we've got a new look at what's coming our way in the form of this new trailer, which looks to be more of the same. The returning cast includes Jason Sudeikis (We're the Millers) as Red, Josh Gad (Beauty and the Beast) as Chuck, Bill Hader (Barry) as Leonard, Danny McBride (Alien: Covenant) as Bomb and Peter Dinklage (Game of Thrones) Mighty Eagle. They're joined by a host of new additions to the cast such as Sterling K. Brown (This Is Us), Rachel Bloom (Crazy Ex-Girlfriend), Eugenio Derbez (Overboard), Zach Woods (Silicon Valley), Awkwafina (Crazy Rich Asians), Lil Rel Howery (Get Out), Dove Cameron (The Descendants), Beck Bennett (Brigsby Bear) and Brooklynn Prince (The Florida Project). Leslie Jones (Saturday Night Live) is on board as the movie's main villain. Sadly, we don't get a taste of what Jones will be doing in this new trailer. The Angry Birds Movie 2 centers on a new threat that emerges, which puts both Bird and Pig Island in danger. As a result, Red, Chuck, Bomb and Mighty Eagle recruit Chuck's sister Silver (Rachel Bloom) and form an uneasy alliance with pigs Leonard, his assistant Courtney (Awkwafina), and techpig Garry (Sterling K. Brown). This unlikely band of heroes will have to find a way to work together in order to save their homes. Thurop Van Orman of Adventure Time fame and John Rice of King of the Hill fame are co-directing the sequel together. Peter Ackerman (Ice Age) penned the screenplay. Clay Kaytis and Fergal Reilly helmed the first movie and, for whatever reason, didn't return. The Angry Birds Movie, released in 2016, grossed $352 million worldwide working from a budget of $73 million. That made it a solid success, which paved the way for the sequel. 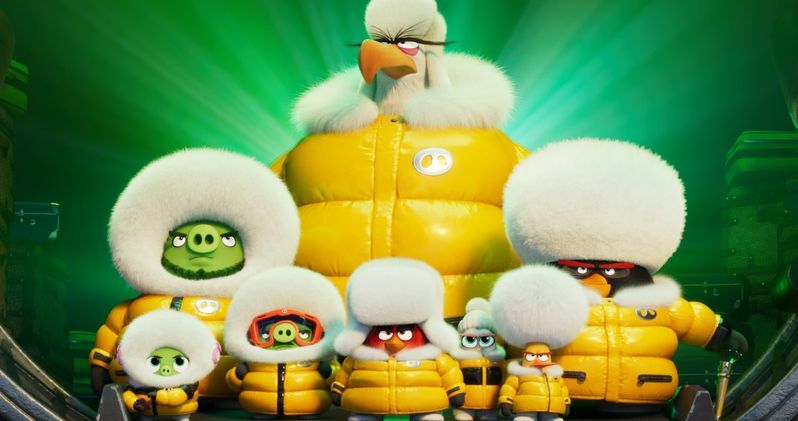 The Angry Birds Movie 2 is set to hit theaters on August 16. Be sure to check out the brand new trailer from the Sony Pictures Entertainment YouTube channel below.